One of my favorite episodes of the 90s show “Martin” (@3:25) is when his toilet gets clogged, and he reluctantly agrees to hire a plumber. At first, he was willing to do anything accept hire a plumber. He was willing to get in the bathroom and fumble around himself, probably making the problem worse. Eventually, the plumber shows up, and as is often the case in most sitcoms, he represents every stereotype that people have about plumbers. Upon inspecting the toilet, as thoroughly as one could while eating a sandwich, he rattles off a litany of possible issues that could be wrong with the commode. He uses a lot of technical plumber jargon to describe what might be wrong, and when Martin asks “What are you talking about?”, the plumber eventually replies “It may cost you a little, it may cost you a lot, but it will cost you”. The hilarity of the episode occurs as the plumber falls into a stupor and Martin and his friends think he’s dead and they respond in a variety of hilarious ways to this seemingly tragic event. The reason I like this episode so much, in addition to this great musical number towards the end, is because that one line was so funny to me, and it can be applied to so many scenarios in everyday life. Today, I want to talk about “The Cost of Social Media”, and in order to do that, I’m going to start by saying: “It may cost you a little, it may cost you a lot, but it will cost you”. 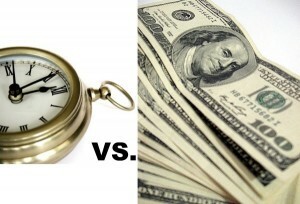 What I want you to understand, when I say “cost”, this doesn’t just mean “money”, and can also be “time”. One of the top inquiries I see in the Social Media Sphere is among people that wonder about the fees that Social Media Consultants charge, and whether or not it’s worth it, given that most social media tools are free. People who think like this are short-sighted, because they fail to realize there’s an “opportunity cost” to every decision we make. And as my high school economics teacher explained it “The opportunity cost is the basic relationship between scarcity and choice“, meaning that the “opportunity cost” of something, is based on what you have to give up in order to get something else. For instance, if there are two events occurring at the same time that you want to attend, say a concert and a child’s recital, the opportunity cost of attending the concert is missing the child’s recital. It’s the opportunity you give up, in order to attain something else. In terms of social media, I think one of the biggest things that people forget is that it’s called “Social Media”. One of the basic premises of how it works is that it’s “social”, as in using the power of social relationships as a marketing tool. As with any relationships, it takes time and attention, and if you want to be one of the people capitalizing on the popularity of the social media phenomenon, you have to decide now, if you’re willing to make the investment of your time, or the time of a qualified person who’s capable of nurturing those relationships in the social media space (which in turn will cost money). Social Media takes the age-old practice of “word-of-mouth marketing” up a couple of notches, and as a business seeking to be a part of the conversation by using social media, the whole purpose of your social media campaign should be to have an active role in that conversation. And not just becoming one of the many people shouting about their brand in the social media space. So the bottom line here that I want people to walk away with today is this: The Cost of Social Media = It may cost you a little; it may cost you a lot; but it will cost you. You have to be willing to make the investment that it takes to make social media work in your company. Becoming a part of the social media conversation is not just about sending out Twitter updates about a sale, or updating the status on your Facebook page to announce an event you’re having. It’s commenting on the posts of friends, fans, followers, connections, subscribers, and just about anyone else who’s taking an active role in acknowledging that you exist in this space. It’s promoting the events of others, and talking about the good works that people are doing around you in your local community, or within your field. It’s being a part of the conversation by realizing that there is a conversation, and that it’s not all about you and your business. Being a part of that conversation takes time, and if you’re not willing to take that time personally, then it’s going to take money, because the people that are really good at navigating the social media landscape, don’t come cheap. And I think the latter part of that statement is really key, and it’s something to think about if you’re one of those people who’s intent to hire their 15 year old niece or nephew to handle their social media because they’re good with a smartphone. Understand there’s an opportunity cost for every decision we make, and just keep that in mind, moving forward. So, with that in mind, I ask: Are you ready to make the needed investment in social media for your small business?